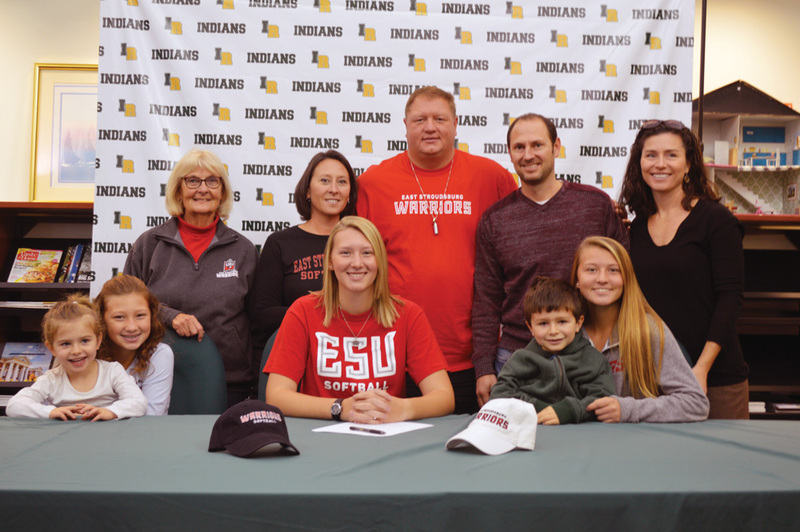 Ultimately, for IRHS senior Abby O’Shields, it was a combination of both academic and athletic opportunity at Division II East Stroudsburg University that was the most enticing. In front of a crowded library inside the high school, where family and friends gathered, O’Shields this week made her official announcement that she was going to become a Warrior and don the red-and-black come next fall. O’Shields — who will major in pre-engineering, with aspirations of becoming an aerospace engineer — is the oldest of three kids of parents Sam and Theresa O’Shields. The lefty is hoping to continue the success the IR softball program has had the past few years and cap her senior season with a state title. During the 2018 season, O’Shields helped guide the Indians to the Henlopen Conference South Division crown and a 13-6 overall mark. Their season ended abruptly in the first round of the Division II state playoffs, following a 4-1 setback to Lake Forest. Following the high-school season, O’Shields joined the Delaware South team to participate in the 2018 Carpenter Cup, a high-school showcase tournament in Philadelphia. There, she teamed with Sussex Tech’s Taylor Wroten in the circle to lead the Delaware South team to the tourney championship. O’Shields will be heading to a Warriors program led by Jaime Wolbach, who will be entering her fourth season at the helm this coming spring. The Warriors, who compete in the Pennsylvania State Athletic Conference, finished 14-26 overall in the 2018 season. Currently, there are two other girls from Delaware on the roster — junior Kaylee Hazewski (Middletown/Red Lion Christian) and freshman Rachel Seiverd (New Castle/St. Georges Tech). In addition to her parents, O’Shields was joined at the signing announcement this week by her sisters Savannah and Parker, grandmother Ruth Schifano, aunt Sarah Schifano, uncle Matt Schifano, and cousins Grace and Anthony Schifano.